In this post I will be talking about. A quick recap of what happened in Part 1 and 2. I had breakfast at Eric Kayser and visited Musée D'Orsay before heading to Rue Cler, Eiffel Tower and Arc de Triomphe. 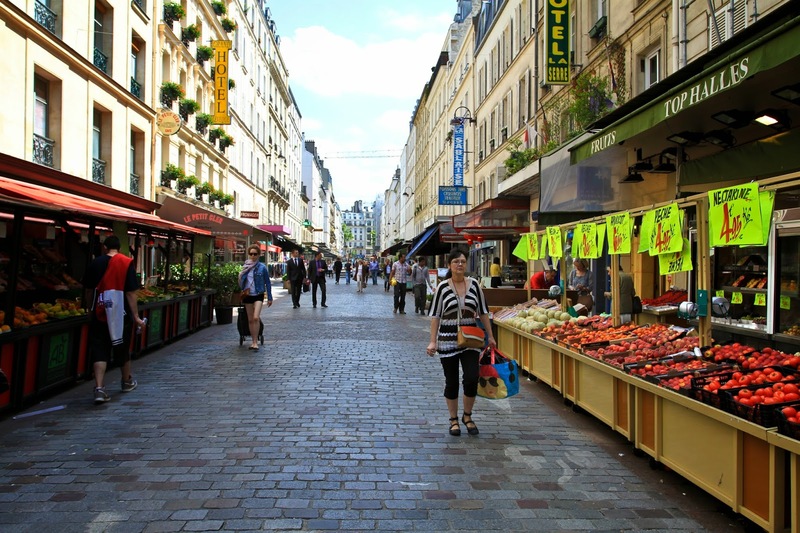 Rue Cler is a street market in the 7th arrondissement. 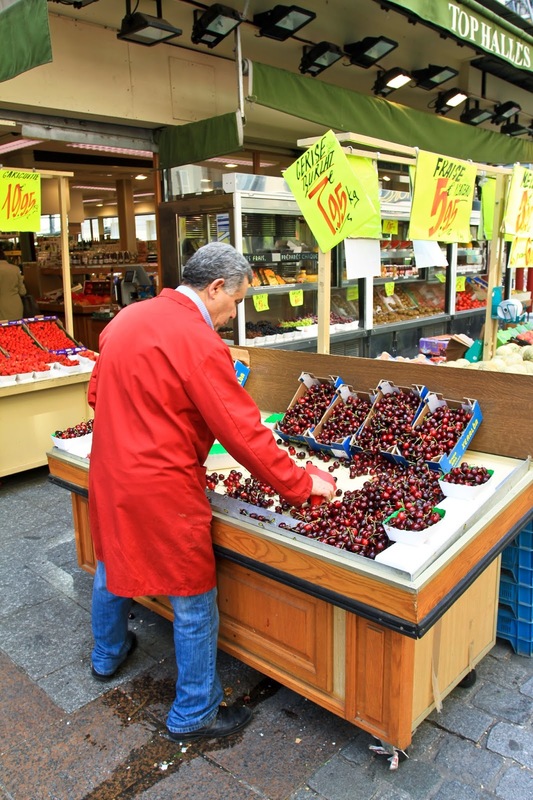 One of the most convenient market streets in Paris that is minutes away from the Eiffel Tower. The market is a pedestrian street with shops that spill onto the road. Here you can find a wonderful selection of speciality food such as patisserie, butchers, delicatessens, cheese specialists, fishmongers, greengrocers, chocolate shops and cafes. This is a great place to build up a picnic. Get some baguettes, cuts of meats, cheese to build a sandwich that you can dine under the shadows of the Eiffel Tower. You can even get flowers for your love ones. They are opened all day from Tuesday to Fridays and in the morning during the weekends. Go early on Sunday to avoid the crowds. My family bought a couple of sandwiches. There are various cafes that offer set menus too! Check out the nice looking cherries from Top Halles (left). 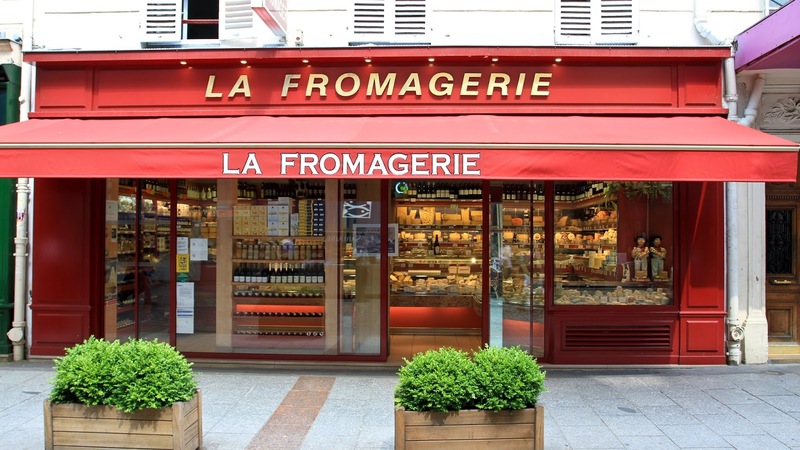 You can get some nice cheese from La Fromagerie. Finally, we walked to the Eiffel Tour, after a long 2km walk from the Musee D'Orsay. It was definitely a slow and relaxing walk. Arriving by foot definitely avoided all the touts which you will meet on the way out. The Eiffel Tower is a global cultural icon of France and one of the most recognizable structures in the world. Being the tallest structure in Paris, you have to visit it! It towers at 324 meters, roughly the height of an 81-story building. Unfortunately, the Paris Museum Pass does not include the Eiffel Tower. Do remember to buy your tickets in advance for the Eiffel Tower to avoid the lines. You can get the tickets 3 months in advance. It will cost you 9.00€ (adult) to get to the 2nd floor and 15€(adult) to get to the summit. By the time I checked the online ticketing, the tickets were all snapped up! I was worried that I will have to queue up for the tickets on the day itself. Many suggested that I arrive early to beat the lines or take the stairs to the 2nd floor for 5€ (710 steps). Eventually, I found an alternate option. 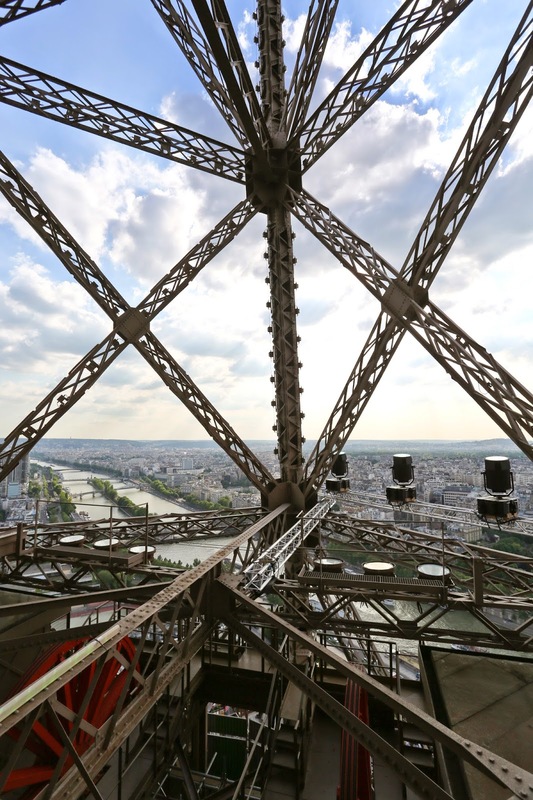 I decided to do an Eiffel Tower behind the scenes tour ( Adult, 22.90€ / Child 19.90€)! The tour is conducted by Cultival and includes tickets up to the 2nd floor. There are perks when you follow such tours as you get to skip the lines! 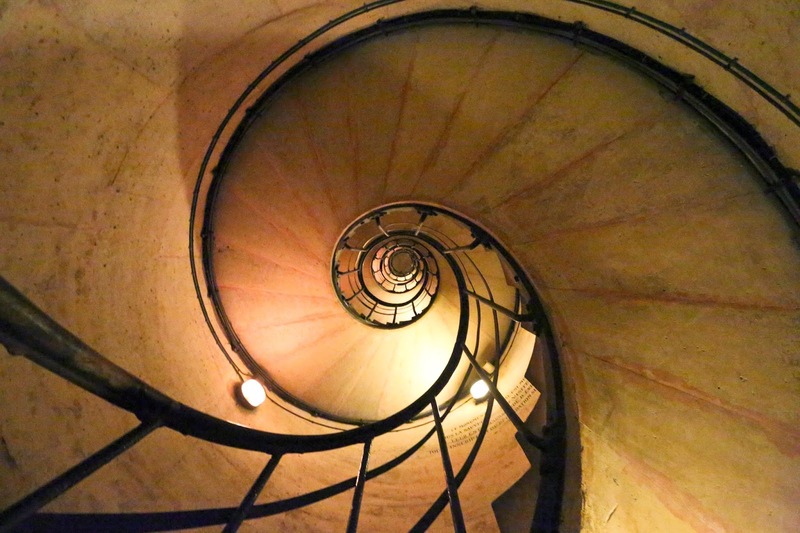 Other highlights include the little-known sites such as the WWI underground military bunker located beneath the Champ de Mars, the Eiffel Tower's engine room and views from the rooftop terrace of Alain Ducasse's restaurant - Le Jules Verne. We were led to the underground military bunker to be told the history of the tower. The Eiffel Tower was build for the World's Fair to celebrate the centennial of the French Revolution. However, the tower was to be torn down after its 20 years lease as it was never intended to be a permanent structure. Many disliked the Tower design. 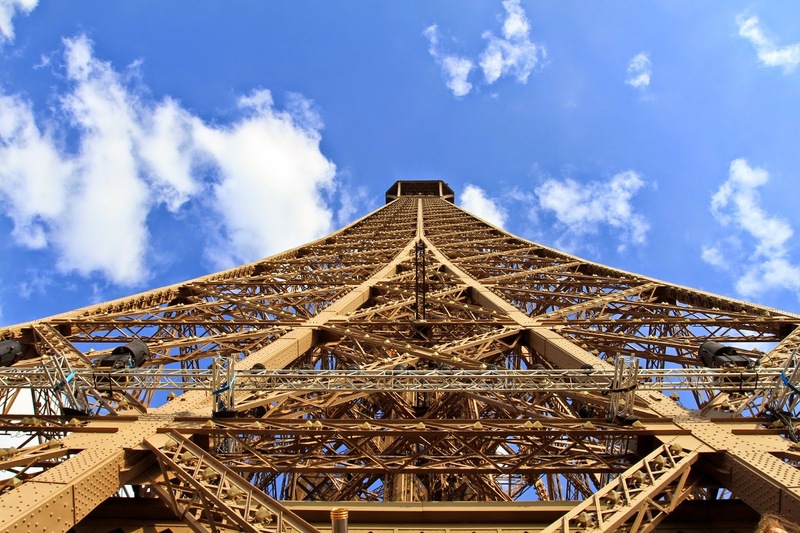 The conversion of the Eiffel Tower into a radio transmission tower saved it from demolition! 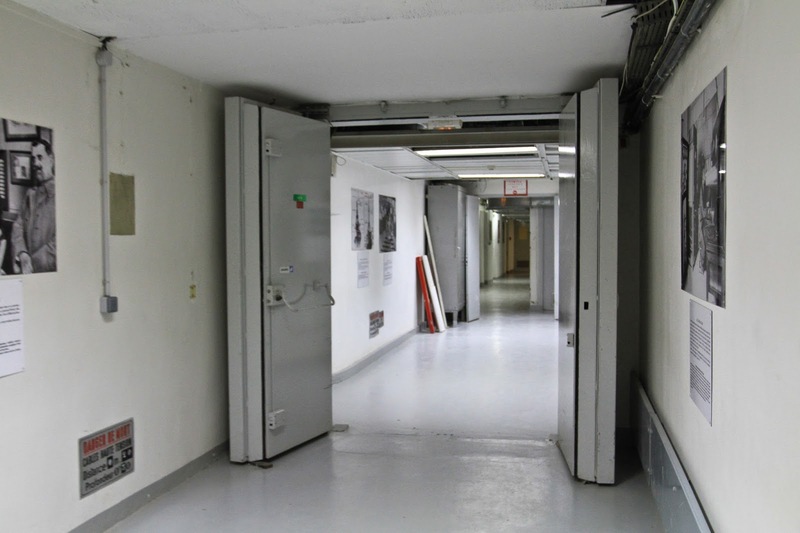 The bunker had thick metal doors with posters sharing stories of the World War 1. The Tower had radio jammers in World War 1 which were used to jam German radio broadcasts and after World War1, was used for civilian broadcasting. 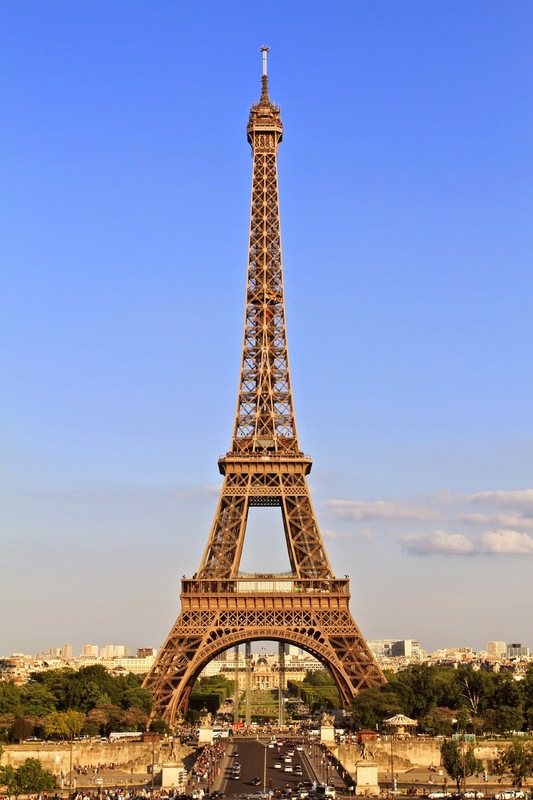 A fun fact would be that the Eiffel Tower broadcasted English Queen Elizabeth II's coronation throughout France! The Eiffel Tower has to be painted with 50 to 60 tons of paint every seven years to protect it from rust. Check out the layers of paint from the picture below. The height of the Eiffel Tower varies by 15cm due to temperature. The Tower is painted darker at the top and gradually lighter at the bottom! Parts of the lift that brings you from the groun to the second level. Building the lifts was an engineering feat as the tracks had to over come the changing angles. 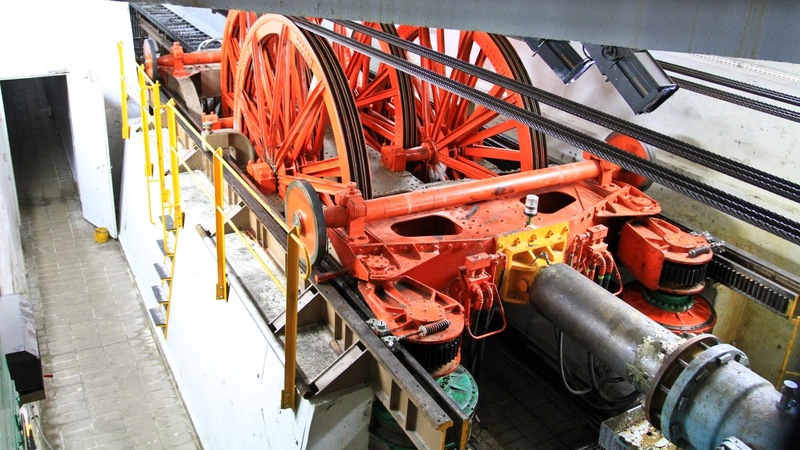 below is a photo of a chariot/carriage which slides back and forth, pulling and releasing the cables that eventually moves the lifts. 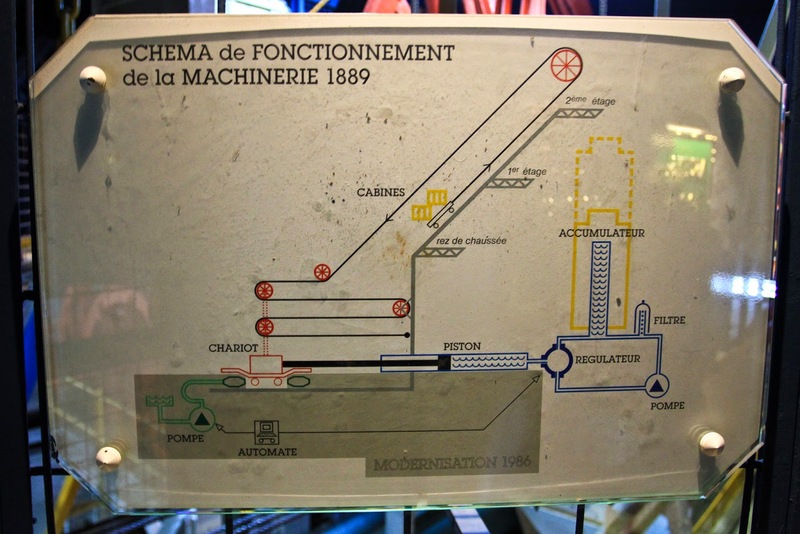 The Chariot which is one of the machinery that powers the hydraulic life. 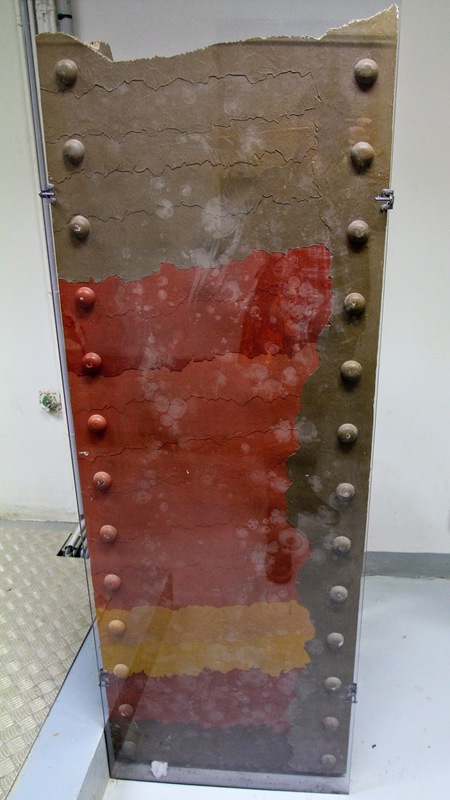 A picture of how the lift works. The cables well maintained. One interesting story of the elevator is that they were cut during the WWII so that Nazis could not use the tower. This is one of the electric elevators which brings you form the 2nd floor to the top floor. Unfortunately, the queue for the lift to the summit was ridiculously long and our tour guide "hinted" that it wasn't worth the views unless you really want to see Gustave Eiffel's office and a champagne bar which sells champagne between 12€ to 21€. The view from the rooftop terrace of Alain Ducasse's restaurant. We were brought to the top of Alain Ducasse's restaurant. Check out the junction of structure struts and the Seine River further out. 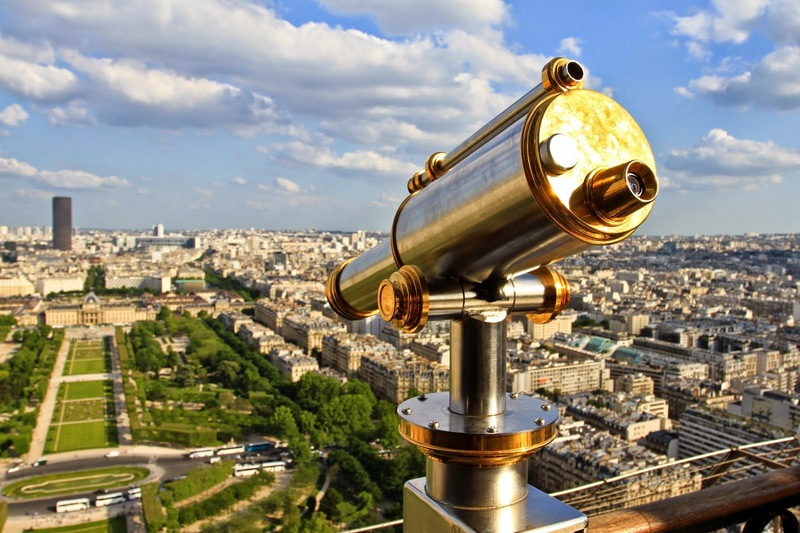 Vintage coin operated binoculars on the Eiffel Tower. Looking up from the second floor of the Eiffel Tower. It is definitely a symbol of modern science. In fact, the tower has 72 French scientists, engineers and mathematicians engraved in recognition of their contribution. Click here to find out more. After the tour, we spent sometime to take in the views of Paris before heading across a bridge to Trocadero Square. This is said to be the best view of the Eiffel Tower. However, there are plenty of African men selling Eiffel Tower key ring which they sell at 5 for a euro. The police in France are doing their best to stop such street vendors. Although I took many pictures of the city, I did not take any of these people. -_- Just ignore them and they won't be bugging you to purchase their "glow in the dark" Eiffel Tower key chains. We board the train (M6, 3 stops) from Trocadero station to Charles de Gaulle-Etoile where we visited the Arc de Triomphe. The final Paris Attraction for the day would be the Arc de Triomphe. It is situated in the center of the Place Charles de Gaulle traffic circles. A memorial in honor of the French soldiers lost in the Napoleonic and French Revolutionary wars. 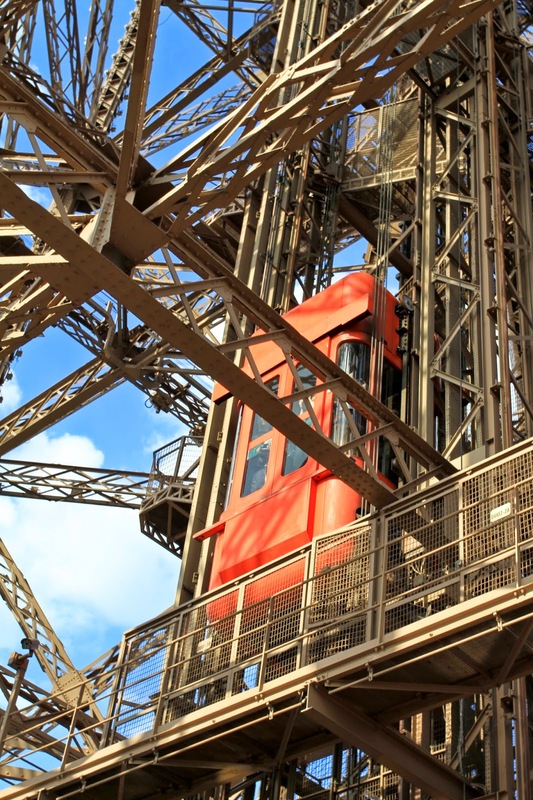 It is probably the second most recognised structure in Paris. The Arc de Triomphe is 49m high, 45 m wide. The names of 128 battles fought by the French Republic and Napoleon between 1792 and 1814 are engraved on the walls under the vault. The tickets cost 9.50€ for an adult but is included in the Paris Museum Pass. There is no queues for this attraction and it has one of the best views in Paris. 12 Prestigious avenues radiate out from the arch which allows for neat rows of buildings. Please be aware that you will have to climb 284 steps, or take an elevator to the mid-level and climb 46 stairs to the top. Visitors with limited mobility will have to reconsider this monument as you must climb the remaining 46 steps. Check out the stairs. They aren't as bad as the Notre Dame Towers or Sacre Coeur. There are two stair cases where one goes up and the other goes down. You could take the elevator if you really need it. Just mention that you have a bad knee. ;) But a little exercise won't hurt as you will be rewarded with amazing views of Paris! The Stairs from the bottom to the top. And as promised, the amazing view you will see from the top of the Arc de Triomphe. 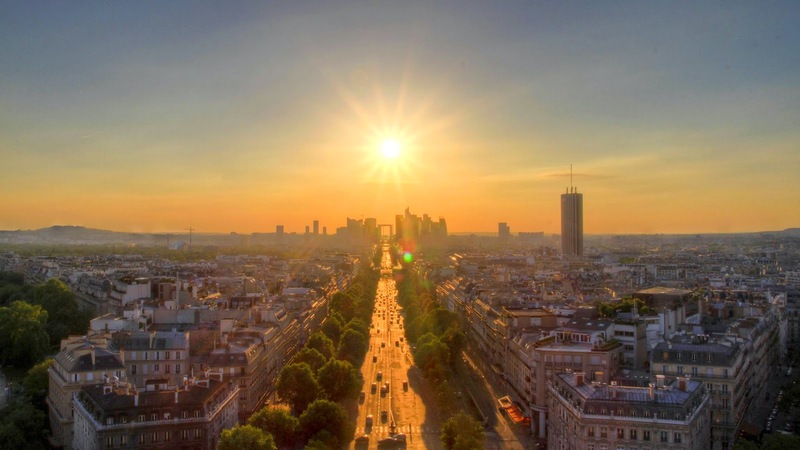 You can see the Champs Elysees towards the Lourve, over the Place de la Concorde and La Grande Arche de la Defense. 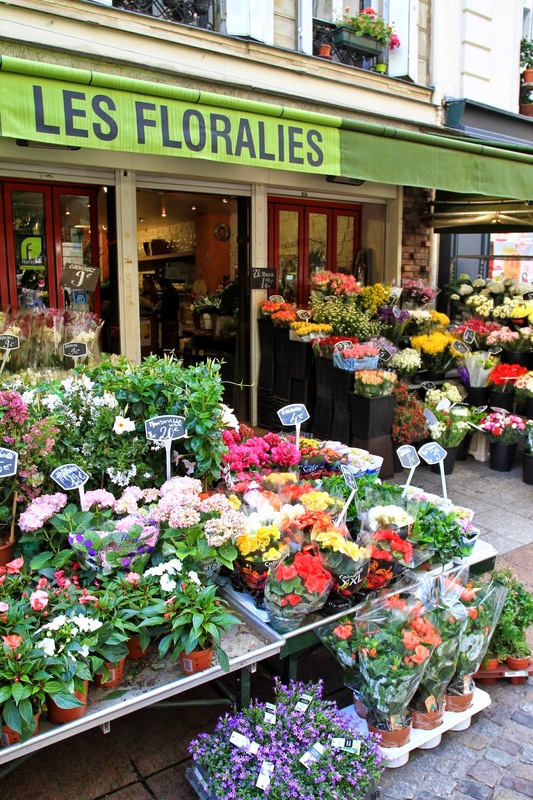 - Rue Cler is a street market near the Eiffel Tour. Most of the stores open from Tuesday - Sunday. All day on weekdays and the mornings on weekends. - The Eiffel Tower tickets are released 3 months in advance but you will have to purchase them at least 2 months in advance. Otherwise, consider arriving early or taking a tour or the stairs. 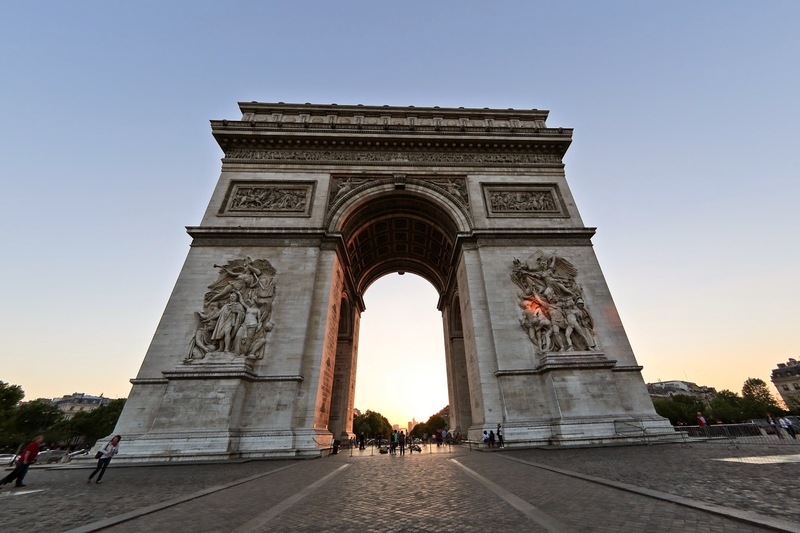 - Arc de Triomphe has one of the best views in Paris where 12 streets converge at this circle! Arc de Triomphe is at the west end of the Avenue des Champs-Elysees. A shopping avenue like Oxford St in London and Orchard Rd in Singapore. Here is the map for Day 5 of my London & Paris Trip.